I’m taking part in the challenge again! Thanks to the wonderful Alex J Cavanaugh for running it again this year. Visit the link above if you want to take part! This entry was tagged A-Z Challenge, Alex J Cavanaugh, Blog, Blogging From A-Z Challenge, Writer, Writer Resources, Writers Resources, Writing. Bookmark the permalink. It sounds interesting. Not sure I have enough to post about to participate though. I’ll be looking forward to whatever you post. There definitely seems to be a clear winner for what people think I should pst about. Taking part? Hell no. Too much pressure. Good luck to you! I had a blast last year, so I will be participating this year as well. I can’t decide on the theme. Since I moved back to my home town, I wanted to do a A to Z of Dallas (Past and present highlights of my life), but in flash fiction pieces. Very ambitious for 26 posts in 30 days. I will think on it more. So did I Sydney, there’s a lot more people taking part this year! Sweet! 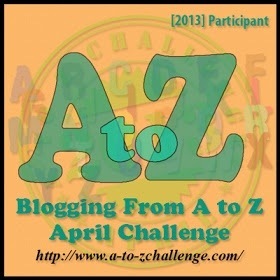 I really enjoyed your A to Z challenge last year! I’m doing this Vikki. I think you’d probably find the A to Z of writing easier because you can make things fit. Just my thoughts. I need to start prepping! Do you know what you’re doing yet?